Often used in Bordeaux-style red blends, the Petit Verdot varietal is known as the “small green” because of its tendency to ripen late. Frequently, the crop will be lost because of its unpredictable maturation, one factor in its declining popularity in the Bordeaux region. In the warmer climates of the New World, however, the varietal ripens more reliably. Petit Verdot is commonly used as a seasoning in blends to add stronger acidity, tannins and shades of dark purple. 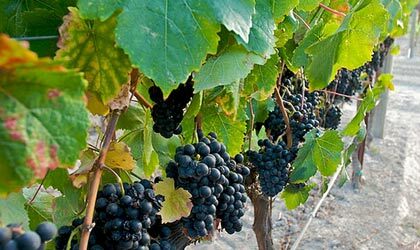 As a varietal wine, Petit Verdot displays flavors of blackberries along with aromas of banana and pencil shavings when young, and notes of violets and leather when mature.